Senior League title winner John Webster has been charged with leading Holwell Sports into a new era after taking over at Welby Road. Webster was confirmed as the successor to Simon Daws who ended his eight-year reign as boss at the end of last season. At 34, he becomes one of the youngest managers in the club’s history and is part of a new regime after a wholescale summer clearout. Jon Allsopp has made the short trip from Bottesford FC to take charge of Holwell’s struggling reserves team, and the club are also set to launch a development side as part of a revamped junior set-up. Webster finished as a player in his early twenties and took up coaching with a Sunday side in his home town of Shepshed a few years later. Switching to Saturday football, he helped Loughborough Dynamo avoid relegation before being approached to take over the reserves at Rothley for the 2010/11 season. The following campaign he was promoted to first team boss, guiding them to the Senior League and Beacon Bitter Cup double in a spectacular debut season. Having turned down offers to move elsewhere, Webster helped Rothley defend their league title before work commitments forced him to step away from management. A return to football came last season with a coaching role at Melton Mowbray before deciding to apply for the job at their local rivals. The role offers Webster a first chance to manage at step six, but he is not daunted by the challenge that presents. “Managing in the East Midlands Counties League doesn’t faze me,” said. “We will be ready to go. “I had the desire to get back into management again and saw the advert so I took the plunge. “I think Graham (Lewin - chairman) was impressed with what I could offer in terms of players I can bring in, and I was delighted to be offered the job. Webster has big shoes to fill with Daws securing four top seven finishes during two spells at the club. A difficult final campaign which began with success in the FA Cup ended sourly as injuries and player departures ravaged the first team for much of the season. Daws was quick to admit the club needed a fresh start and the 34-year-old is keen to provide it. “For next season, realistically, I just want the team to improve,” Webster added. “I want to get to know the league and what the opposition are all about and I will then feel in a position to go to the club and tell them what I need to compete. While the sweep of a new broom will inevitably alter the identity of the first team, Webster is keen to make use of what he has at Holwell and add to it. 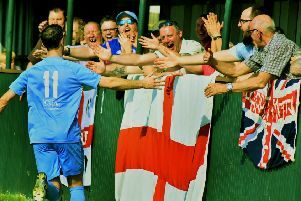 He is hopeful of persuading key players to stay on, including long-serving centre-half Aaron Ridout, last season’s leading scorer Graham Wells and midfield lynchpin Chris Hibbitt. He said: “I’ve spoken to a core of about 10 to 14 players who will come to pre-season and I’m confident they will sign. “In addition I’ll hope to attract some of my own players from Leicester and Loughborough, so there is a big pool of players to tap into. Webster also brings a sizeable backroom team to Welby Road, including assistant managers John Wilkinson and Andy Hill, first team coach Anthony White and goalkeeping coach Pete Allen. Pre-season preparations begin this week ahead of the first of six friendlies on Saturday, July 9. “I’m massive on coaching and get a buzz from helping individual players to improve,” he added. “As a football club I want to make us open to anyone to come along to pre-season. * Training takes place at Redwood Park on Tuesdays and Thursdays at 7pm, and Saturday mornings at 10.30am (except for matchdays).